Early Wednesday evening (Nov. 28), soon after the sun has set below the horizon, there will be two bright objects rising into the night sky. They are the nearly full moon and a brilliant silvery star-like object shining with a steady glow — the planet Jupiter. Jupiter and the moon will rise in the east-northeast, opposite of the sunset, offering stargazers an celestial treat. Calendars and almanacs will tell you that the moon will be full on this night, but that's not necessarily true. The moon will actually officially turn full officially many hours earlier, at 9:46 a.m. EST (1446 GMT, or 6:46 a.m. PST) on Wednesday, less than an hour after the peak of a minor penumbral lunar eclipse. By the time the moon appears to observers later in the evening, it will technically be a waning gibbous moon. But while the moon will be just a little less than 100-percent illuminated, it will probably still look to many observers as if it was a true full moon. For most places, Jupiter will appear to hover just above and to the upper left of the moon. Jupiter is now the first bright object that comes out each evening in the night sky. It shines low in the east-northeast as twilight fades, far to the lower left of the Pleiades and more closely to the left of the V-shaped Hyades cluster and the bright orange star Aldebaran. The planet will arrive at opposition on Sunday (Dec. 2), making it a brilliant target ideally situated for telescope observing. Jupiter currently lies due south at around midnight local time, 10:45 p.m. by mid-December and 9:40 p.m. by year's end. In even a small telescope, Jupiter's belts, spots, rifts, and other markings invite night after night of study. Almost any common details of Jupiter's cloud features that are reasonably within range of your telescope could be visible at steady moments late on these nights. And of course, also in view will be the four Galilean moons of Jupiter, which can be seen even in steadily held binoculars, changing their positions during the course of the night. On this particular night, depending on when you look, either Ganymede or Io will be crossing in front of Jupiter (in transit); a good telescope may also show you their shadows on Jupiter’s disk appearing as tiny dark spots on the planet’s surface. Because the moon is over 1,500 times closer to the Earth compared to Jupiter, it will appear to shift its position relative to the planet rather noticeably through the night of Nov. 28 and 29. The moon will appear to move at its own width — roughly one-half of a degree — toward the left (east) of Jupiter. 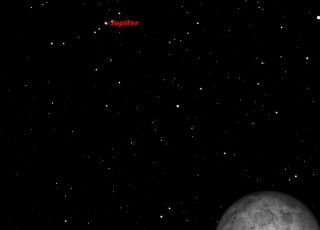 When Jupiter and the moon first appear above the east-northeast horizon at around 5 p.m. local time, the planet will be positioned above and to the left of the moon. The two will be closest at around 7 p.m. Eastern Time (0000 GMT); 6 p.m. Central Time and 5 p.m. Mountain Time. Both moon and planet will be below the horizon when closest for the far West. As the night wears on, watch as the moon slides first directly under Jupiter, then passes off to its left. During the predawn hours, the moon will be seen to be drifting away to the moon's upper left. Editor's note: If you snap a photo of Jupiter and the moon, or the Nov. 28 lunar eclipse, and would like to share it with SPACE.com for a story or gallery, send images, comments and viewing location information to managing editor Tariq Malik at: tmalik@space.com.